Heaven and earth, as the Celtic saying explains, are only three feet apart, but in the thin places that distance is even shorter. I’ve been lucky enough to have seen many “thin places” in my life, in various parts of Europe, in Russia, certainly in Egypt, and in South America. But I’ll tell you that in measuring thin places per square mile it’s hard to beat this lovely place where I live. One of the many reasons I never tire of home is that almost daily experience of coming around a corner, or down a hill and suddenly having the breath knocked out of me by a view so remarkable I have to stop in my tracks. 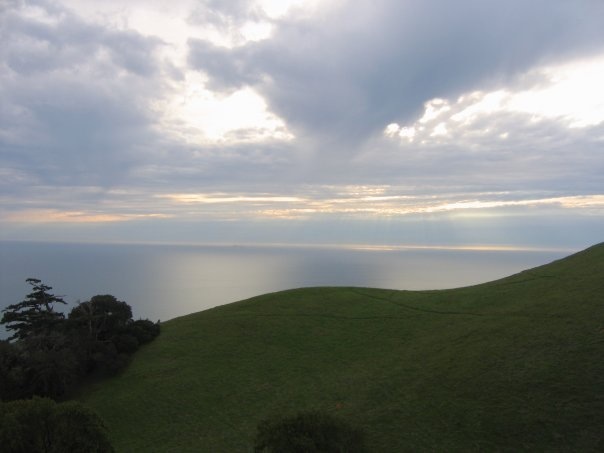 A few months after my Father passed away many years ago, we were sitting on a hill looking out on the sunlight stretching through clouds to the Pacific and my daughter said “Look Mom – I can see Grandpa right there!” A thin place indeed. This entry was posted in Around Town, Miscellaneous, Travel.